Mr and Mrs Peters of Surrey came to World First Travel Insurance when their then current insurer suddenly announced that they were withdrawing from the travel insurance business. It was by chance that they discovered this fact when Mr Peters contacted them approximately three weeks before they departed , to query if a doctors visit needed to be reported on their annual policy, and to request up to date contact details in case of an emergency. He was very concerned at the lack of customer care as he and his wife would have left for Spain and been totally unaware that their medical insurance would have terminated in the middle of their holiday. Fortunately, he had seen an advertisement for World First in the weekend paper and noted that we insured persons up to 100 years of age, so he decided to call our helpline. Although he and his wife are some way off this age, he thought this was a good indication that we would have experience of travel insurance for seniors. Mr Peters was very impressed by his first contact with our adviser, who asked pertinent, straight forward questions and provided a really competitive quotation. Most importantly, all details relating to their telephone conversation were confirmed by e-mail within 10 minutes and the final policy was received by post the following day. Unfortunately, his wife suffered a multiple break to her arm and wrist whilst on holiday which required a lengthy operation and two nights in hospital, so they had to make a claim. Mr Peters said, "It was most embarrassing that having been incident free for more than 25 years, as soon as we switched to a new insurer my wife had an accident that resulted us in making a claim for £2,800; but I suppose this demonstrates the importance of travel insurance." Mr Peters found all his dealings with World First whilst out of the country to be very simple and straightforward. He adds, "Getting in touch was easy and we received the same courtesy and efficiency as when we took the policy out. I have written to all of those involved to express my appreciation. In my opinion, people are very quick to complain about poor service but sadly fail to respond with the same degree of urgency when the service is good". 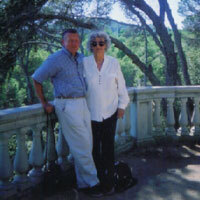 The elderly couple usually travel to their property in the Catalan Province of Girona at least twice a year, taking their car across the Channel using a "Flexible SeaFrance Carnet Ticket", Dover to Calais, and then driving through France. Mr Peters currently has an annual policy with World First and his wife, because of her age, is insured on a single trip basis. Mr Peters concludes, "We will always come back to World First and I would not hesitate to recommend them to our family, friends and associates". Find out more about World First annual travel insurance here.